DS Mega Man ZX Advent (USA) in 1:19:26.35 by Mothrayas. 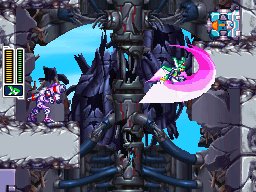 Mega Man ZX Advent is the second game in the Mega Man ZX series. What's so different between the classic series and ZX Advent? First, you get to choose between a male (Grey) and a female (Ashe) character. Then, instead of stealing weapons from the bosses, the player steals the boss itself! Instead of switching between weapons, the player switches between forms using the Biometal Model A. Finally, the player has less freedom to pick the stages of his choice. Mothrayas picks Ashe, the female character, to minimize the cutscenes and to save time. To play the DSM file, make sure that "Enable Advanced Bus-Level Timing" is unchecked in the "Emulation settings".